The Swiss Chard frittata can be served as is, but the addition of poached eggs and Hollandaise sauce, elevate it to another level. As I didn’t want the dish to end up too heavy, I used less eggs in the frittata, than in traditional one, and used the stems as well as the leaves. 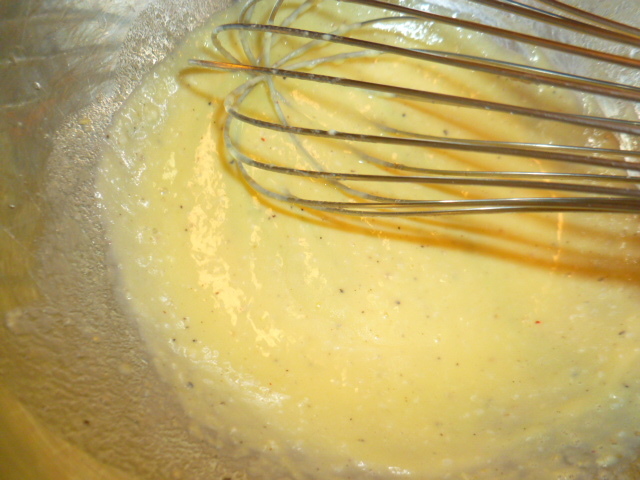 I also used whole egg in the Hollandaise sauce, instead of egg yolks only, as in most traditional recipes. The result was just as rich and tasty. Try it and enjoy. 1. 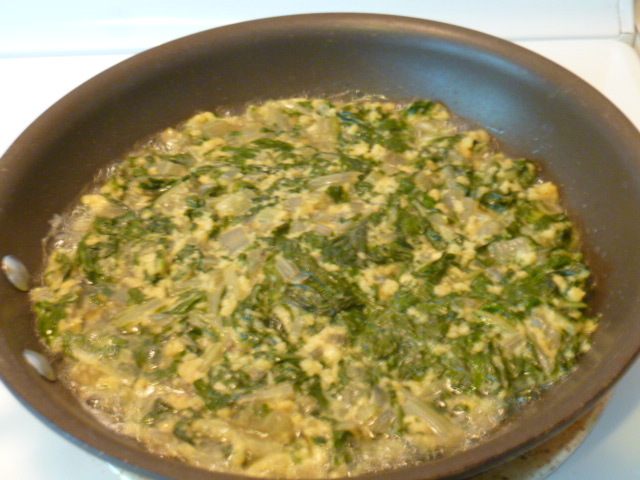 The frittata: with a sharp knife, thinly cut the washed Swiss Chard, stems included. Place in a large flat pot and add ¼ cup water and 1 tsp of the salt. Cover and steam over medium-high heat until the Swiss Chard wilts, and the stems soften. 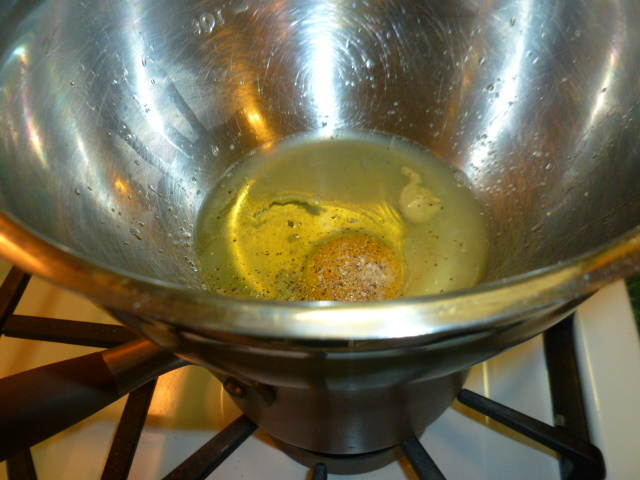 Uncover the pot and keep cooking over medium-low heat, until the water evaporates. Cool to room temperature. You should end up with about 2 cups cooked Swish Chard. 2. Whisk the eggs in a medium bowl. 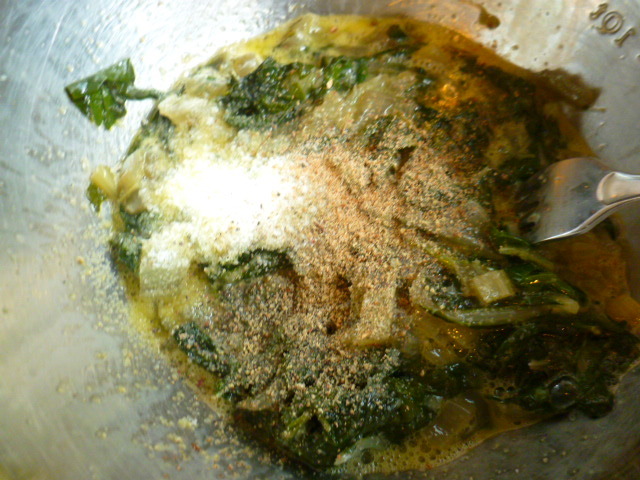 Add the cooked Swiss Chard, rest of the salt, four peppers mix, nutmeg, Panko bread crumbs and flour, and mix well. 3. Heat 2 Tbs of the oil in a large non-stick pan, over medium-high heat. 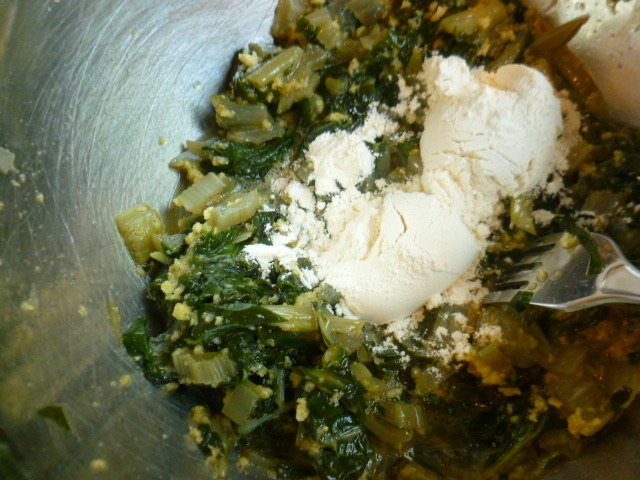 Add the Swiss Chard mixture and flatten with a spatula. Lower the heat to medium and fry until golden-brown at the bottom. 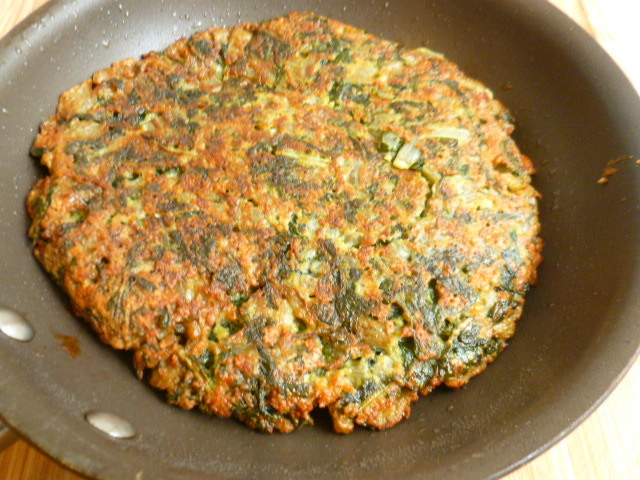 Carefully transfer the frittata to a plate. Add the remaining 1 Tbs oil to the pan, and turn the frittata upside down back into it. Fry until golden-brown and keep in a warm place. 4. 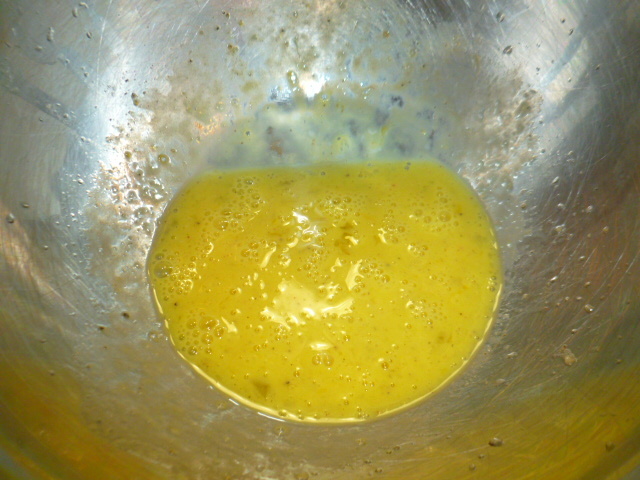 The Hollandaise sauce: in a small pot, bring a small amount of water to a boil. Lower the heat to simmer. 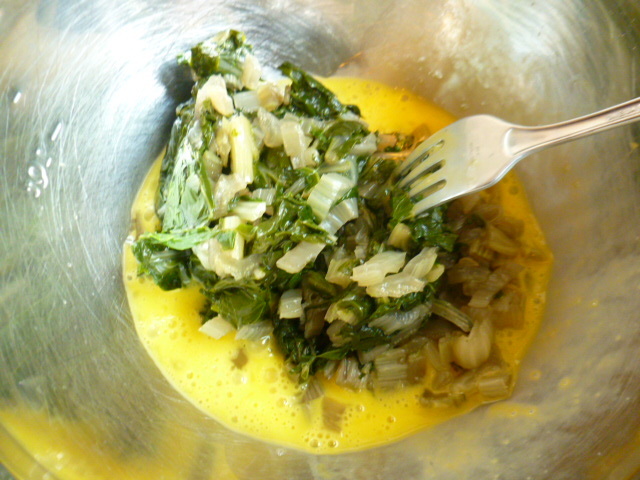 In a small bowl, mix the egg, or egg yolks, with the lemon, mustard, and salt. Place the bowl over the pot, and whisk well. 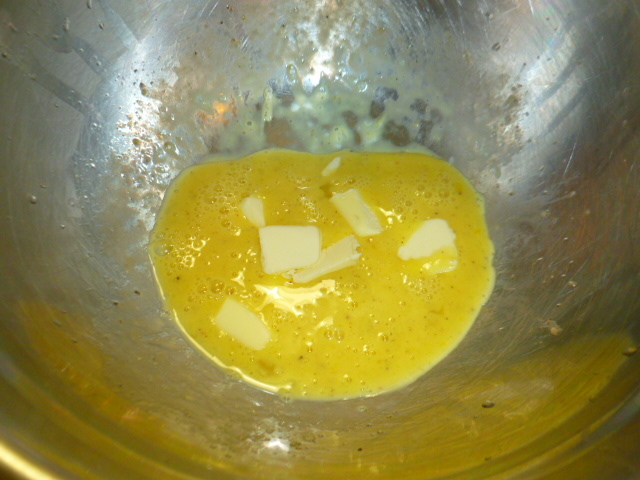 Add the butter gradually, while whisking constantly, until the sauce thickens. Season with pepper and cayenne and keep in a warm place until serving. Make as close to serving time as possible. 5. The poached eggs: break the eggs into small bowls. Fill a medium pot with water up to ¾ of its’ height and add the vinegar. 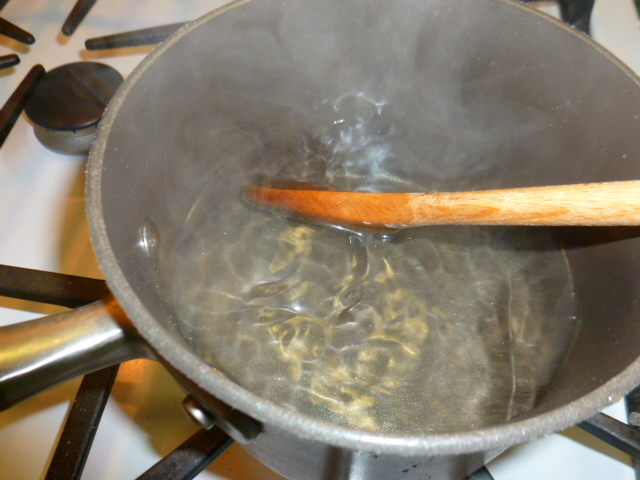 Bring to a boil and lower the heat to gentle simmer. Swirl the water with a large spoon, to create whirlpool. 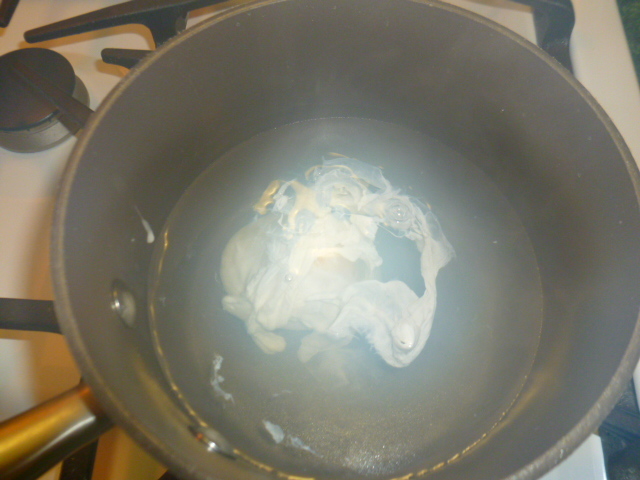 Hold a bowl with an egg as close to the simmering water as possible, and drop the egg into the whirlpool. 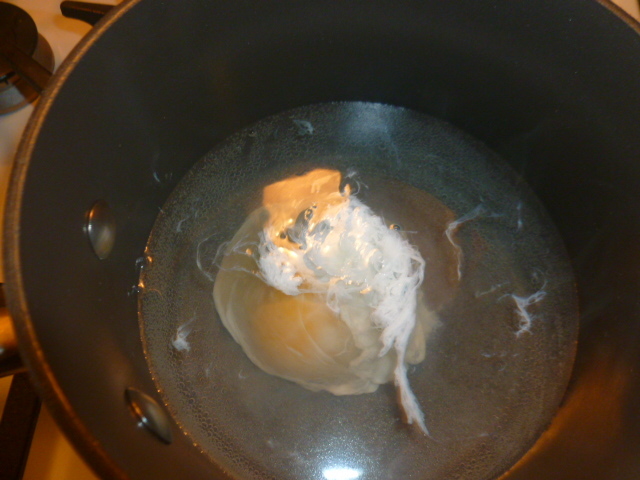 With a wooden spoon, gently move the egg, so it doesn’t stick to the bottom. Poach for 4 minutes. 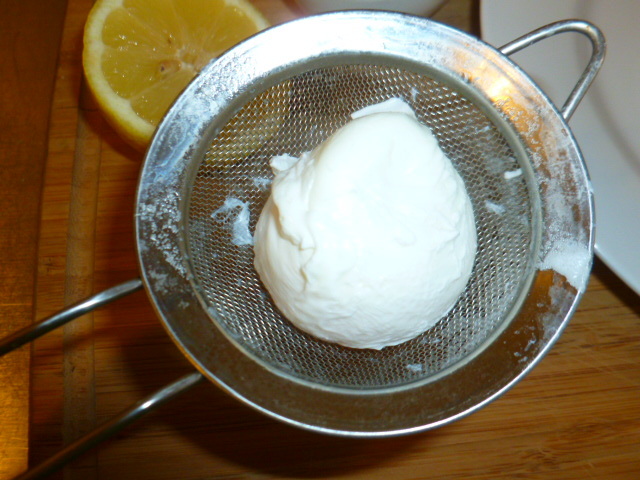 Lift the poached egg carefully, with a slotted spoon or a small sieve. Place on a paper towel, to absorb access water. Repeat with more eggs as needed. Hollandaise is my favorite. Yum!! Thank you Carol, I’m glad you liked my version. It is indeed a rich dish, even with using the whole egg, which is why it’s so suitable for weekend brunch. 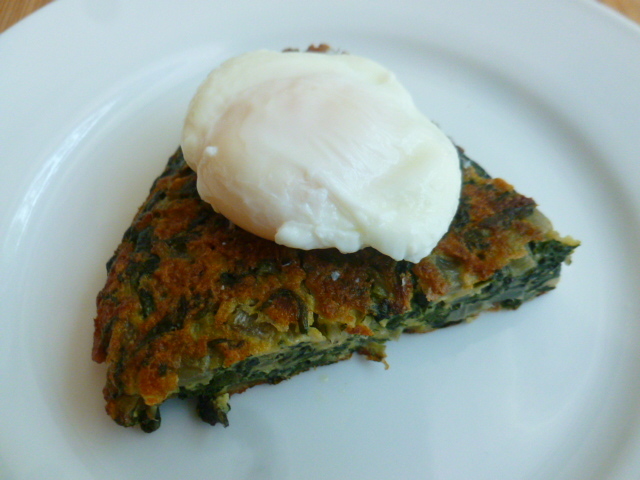 Happy new year Ronit – great to see a recipe that isn’t all about cutting back on calories just because it’s January! Most Saturdays, I have breakfast with my eldest daughter. From Friday night, I wrestle with the dilemma of “porridge or eggs Benedict?” The porridge usually wins, making the more occasional poached eggs all the more tasty. Happy new year Ronit. Nothing better than a frittata even though I usually make it with potatoes/cheese or meat. The hollandaise sauce really makes this dish special. 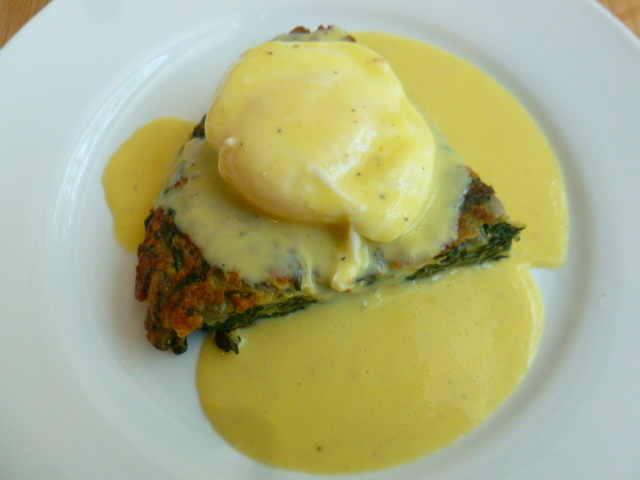 The Hollandaise sauce sounds so creamy and delicious and so does frittata with Swiss Chard. Sounds like a special brunch! Now this is something I’d love to see on a brunch menu!!! Fabulous! mmm. . . this looks wonderful. 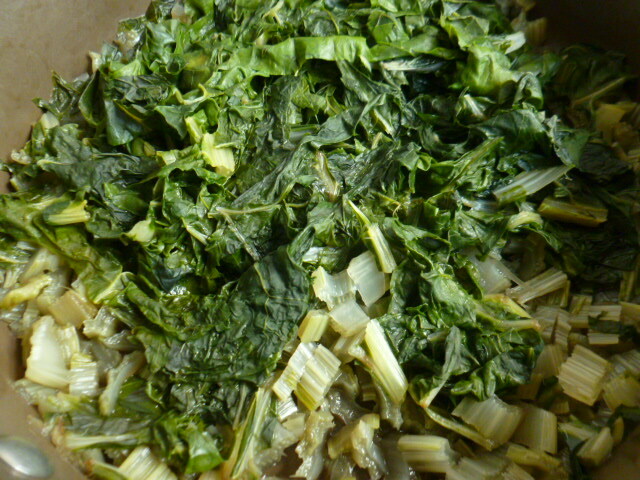 I don’t have many recipes that call for Swiss Chard. It’s good to have another one in my repertoire. 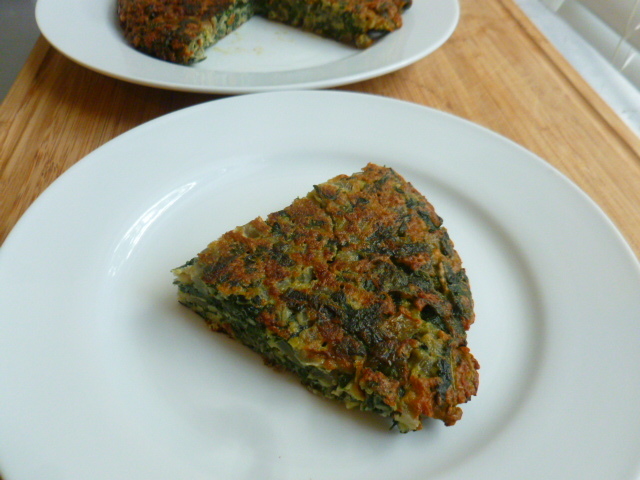 By the way, any recipe with spinach can be adapted to Swiss Chard. 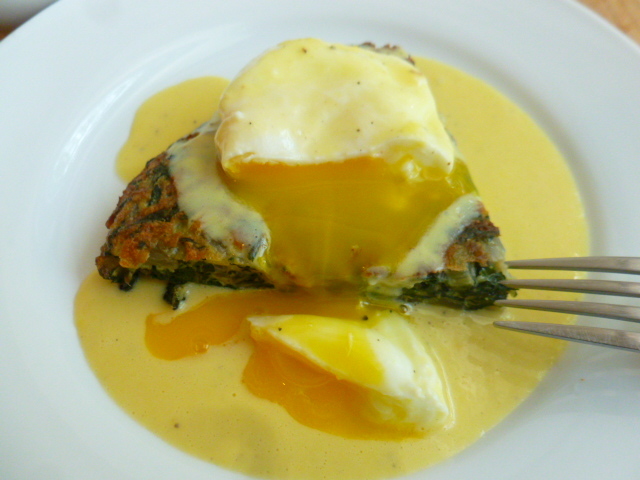 Sounds heavenly; I wish I could come up with a non-dairy way to make Hollandaise sauce. Happy New Year, Ronit! Thank you Dolly, I’m glad you liked the recipe. Maybe you can try the Hollandaise sauce with clarified butter, from which the dairy particles are removed? Or maybe try with goat milk butter, as I know that many people with lactose intolerance can digest it more easily. Thank you for your advice, dear Ronit! I am not lactose intolerant, though; my issue is casein that inflames my pancreas for some reason. I generally use Smart Balance, but it immediately turns to water when heated even slightly. Do you know whether one of the nut butters might work? Thank you so very much, Ronit! 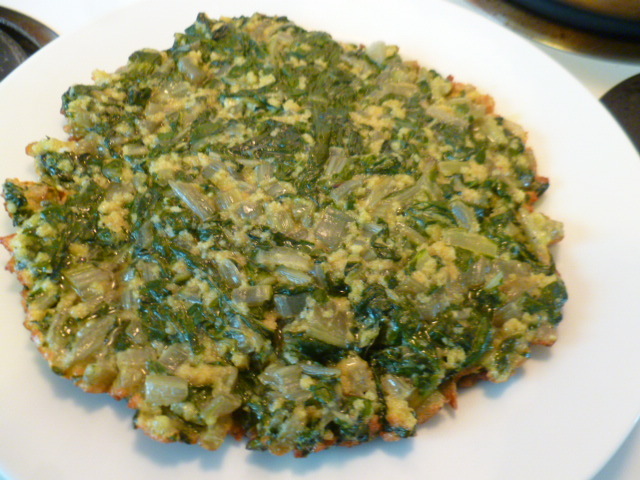 I remember seeing is on your site and thinking of making it with fried fish for Shavuot. I’ll definitely give it a try! You certainly know how to dress up a frittata and make it special. Well done Ronit. When I read the name of your dish I thought frittata with poached egg and hollandaise sauce ??? But then I read on and thought how brilliant. 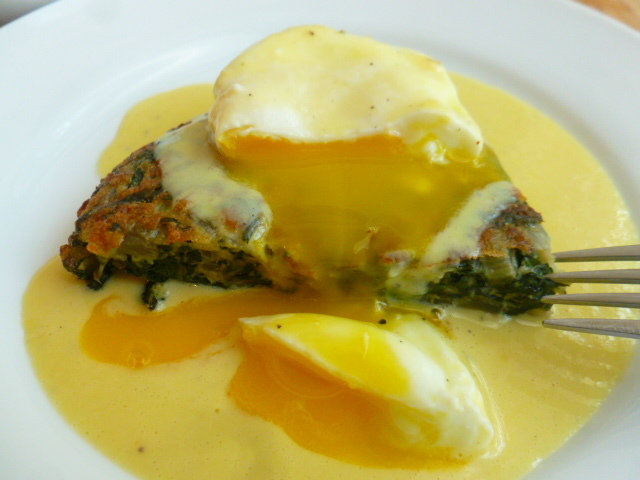 Fewer eggs in a frittata and a runny poached egg with hollandaise sauce on top. How wonderful, we shall take this for a test drive on our next weekend. Thanks for sharing. I just love what you have done. I have eggs benedict frequently and your version is delightful!